My CrAp ShEEt: Today, Babycakes turns TWO! 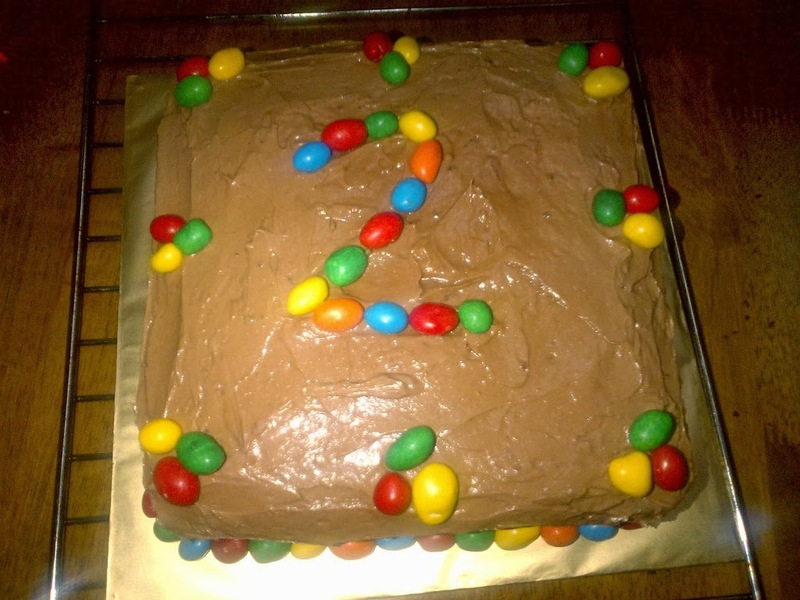 Babycakes turns TWO today, 27 September 2013. Gosh time sure flies. We will be having a small birthday party for her tomorrow just for close friends and family but her friends and teachers at the nursery deserves to celebrate with her as well because she spent so much time with them, grew up with them and her teachers took care of her while Mummy and Daddy are at work. So last night I decided to bake a cake and sent it to her nursery this morning so she can have a little party with her friends and teachers. Recipe from here. I started baking after finished cooking dinner. 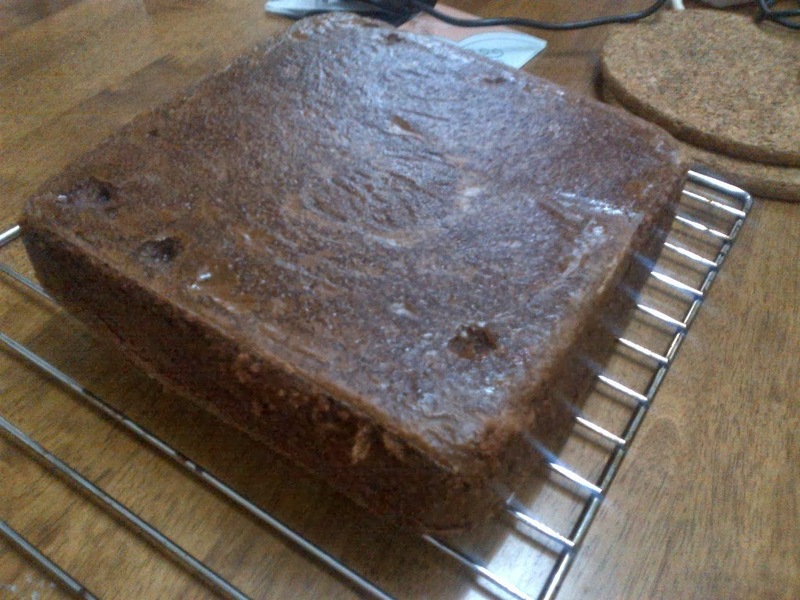 This was the cake after it was turned out of the cake tin and cooled on a rack. Thank God for baking paper (some call it parchment paper, cookie sheet) the bottom of my cake was near perfect. I made frosting differently this time. Normally I would melt cooking chocolate and mix with butter, condensed milk and icing sugar but this time, I made chocolate cream. I have just enough butter and icing sugar and thankfully it's enough to cover the whole cake. 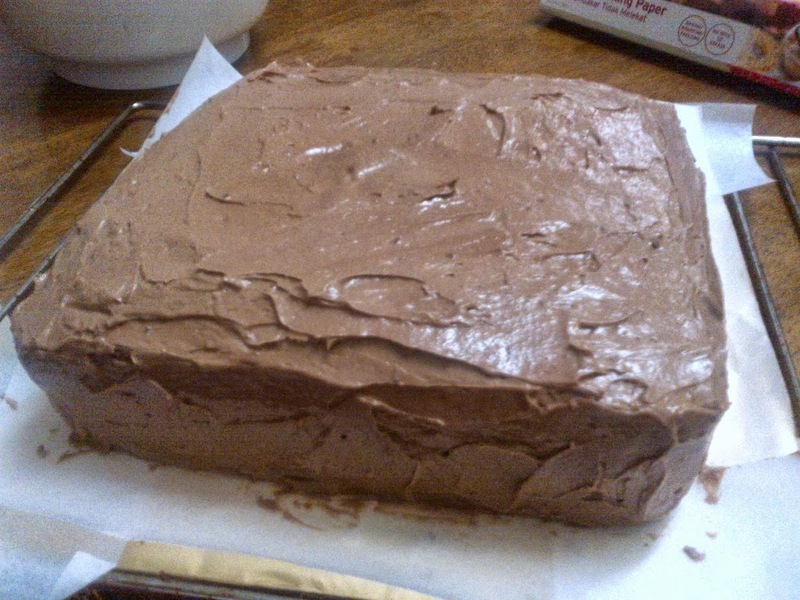 The chocolate cream was a mixture of butter, icing sugar, cocoa powder and milk. I also filled 6 cupcake casings for me to try the cake because I won't know how the cake will turn out, how the taste is like because I won't get to taste it. I bought NIPS chocolates and decorated the cake. 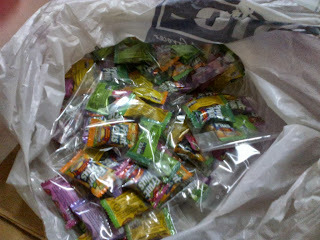 The kedai runcit near my house only sells small packets of m&m so NIPS chocolates will do. Besides, they're cheaper than m&m. :P The cake must be cooled completely before frosting or it will melt. You sure don't want that to happen now, do you? 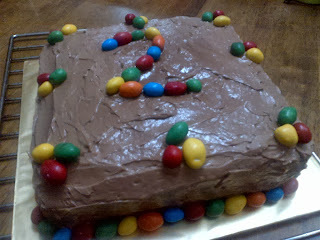 It's not the prettiest of cakes but I bet and I hope it will be a hit amongst the kids. I sent the cake together with two candles and a cake knife. I hope Babycakes and her friends and teachers will have a good time today. I also packed some sweets in small clear plastic bags for the kids. 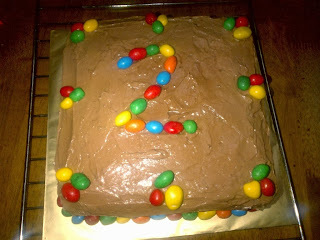 HAPPY 2ND BIRTHDAY BABYCAKES! YOU HAVE BROUGHT SO MUCH HAPPINESS INTO MUMMY AND DADDY'S LIVES AND WE COULDN'T BE MORE GRATEFUL AND THANKFUL TO ALLAH FOR BLESSING US WITH SUCH AN ADORABLE, SMART, CUTE, CHEEKY, HAPPY AND HEALTHY BABY. 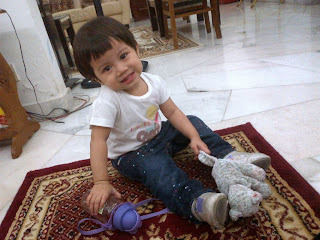 MAY YOU GROW UP TO BE A BEAUTIFUL PERSON INSIDE AND OUT AND MAY YOU HAVE ALL THE BEST THINGS THAT LIFE HAS TO OFFER. MUMMY AND DADDY PRAY THAT ALLAH PROTECTS YOU AND BLESS YOU. MUMMY AND DADDY LOVE YOU SO MUCH!